Heavy rain (totál 37.0mm), heaviest durante la mañana del viernes. Later becoming colder with a dusting of snow el domingo por la mañana. Freeze-thaw conditions (max 15°C el jueves por la tarde, min 0°C el sábado por la noche). Wind will be generally light. Moderate rain (totál 11.0mm) heaviest el domingo por la tarde, then becoming colder with a dusting of snow el domingo por la tarde. Freeze-thaw conditions (max 9°C el martes por la tarde, min -3°C el domingo por la noche). Wind will be generally light. La tabla anterior muestra el pronóstico de tiempo para Megeve en la altitud específica de 1113 m. Nuestros modelos meteorológicos sofisticados permiten prever pronósticos para la cumbre, la mitad y la base de Megeve. Para aceder a los pronósticos de tiempo a otras alturas, pinche en la navegación en la parte superior de la tabla. Para una visión general, consulte el Mapa meteorológico de France. 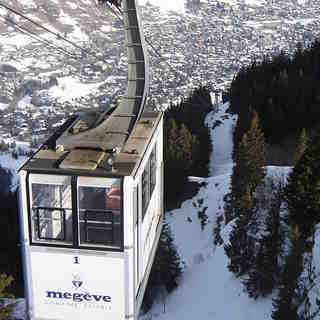 Megeve, although a relatively low altitude resort, boasts some truly excellent skiing for all standards going up to 2500 metres. Ski conditions have been excellent although a little bit slushy and tacky lower down in the afternoon. Overall, though, pretty damn good with the sun out everyday. Still not crazy busy at the weekend in early March; has made for a wonderful ski trip. The only down side are the crazy prices of drink in the town. Actually cheaper at some of the small bars on the slopes which is daft!